The Ottawa Senators are pegged as +120 home underdogs on the NHL odds at sportsbooks monitored by OddsShark.com for Thursday night as they host the Vegas Golden Knights. Several Senators players were left red-faced following the release of a video that showed them criticizing members of the team’s coaching staff during a recent trip to Phoenix. The team suffered a 5-1 loss as +180 underdogs in their Oct. 30 date with the Coyotes, marking their fourth straight defeat. Ottawa, though, has since halted that slide, posting wins in two of four outings ahead of Thursday’s matchup at Canadian Tire Centre. The Senators showed dramatic improvement in their last outing, overcoming an early 2-0 deficit to earn a 7-3 win over the struggling New Jersey Devils as a +115 home wager, and have tallied wins in five of their past seven home dates. However, Ottawa failed to hold an early two-goal lead in a recent visit to Vegas, which sits as -150 chalk for Thursday’s game. 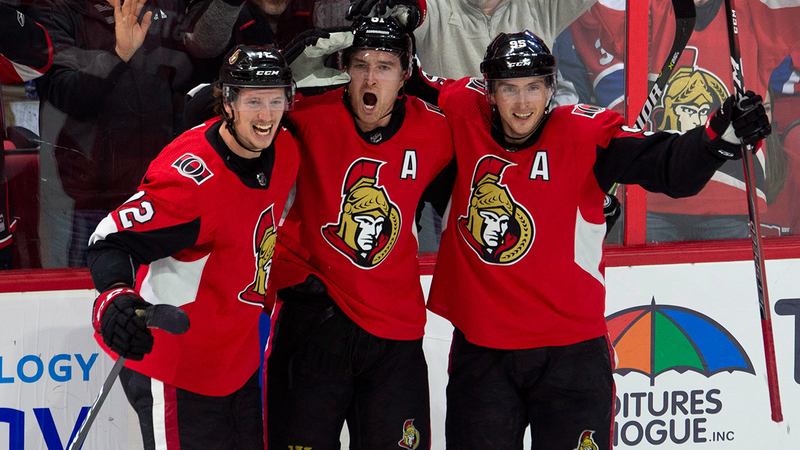 The Senators fell 4-3 to the Golden Knights in overtime as +200 underdogs in an Oct. 28 clash, and they are 1-2-0 in three all-time meetings with Vegas, according to the OddsShark NHL Database. Elsewhere on the NHL Thursday schedule, the Edmonton Oilers look to halt a two-game slide as they visit the Florida Panthers as +115 underdogs. The Vancouver Canucks also look to get back in the win column as they visit Boston as a +195 bet, while the Montreal Canadiens vie for a fourth straight home win over Buffalo as they host the Sabres as -135 favourites. The Oilers have cooled off since their recent 5-1-0 run. Edmonton capped its hot streak with a 4-3 victory in Detroit as -145 chalk on Nov. 3, but has come up short in the past two outings on its current four-game road trip. The Oilers have posted nine straight road wins over Florida, which currently owns a league-worst 3-5-3 record but enters Thursday’s matchup as -135 favourites. The Canucks have enjoyed a solid 9-6-1 start that has left them in a tight battle for top spot in the Pacific Division. However, Vancouver opened a crucial six-game road trip with a 3-2 loss to the Red Wings as a +115 bet on Tuesday, and is winless in its past two trips to Boston. The Canadiens have alternated between wins and losses over their past nine outings, including a 4-3 defeat in Buffalo as +105 underdogs that halted a four-game win streak against the Sabres.